MONTVALE, N.J., March 26, 2019 /PRNewswire/ -- Sharp Imaging and Information Company of America (SIICA), a division of Sharp Electronics Corporation, is excited to participate in the 2019 Digital Signage Expo (DSE) in Las Vegas, March 26 – 29, 2019. Sharp will showcase its latest 4K and Beyond technology in its interactive space, located at booth #1207. 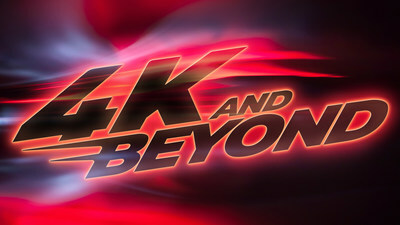 "We are excited to share our latest products, which continue to pave the way for the industry's transition from 2K to 4K," said Gary Bailer, Director of Product Planning & Marketing, Pro AV Products, Sharp Imaging and Information Company of America. "We are focused on the next evolution as we've shown in our move to 8K technology. Our aim is to help create not only smarter meetings, but smarter offices and smarter buildings." This year, Sharp is creating interactive experiences at its booth to showcase the capabilities of its smart signage technology. The booth will include a travel agent, shopping experience and hotel lobby destination content that show the full capabilities of Sharp digital signage and how it would look in the real world. Below are a few of the products Sharp will be displaying in its booth. A number of its new products will be featured at DSE this year, including the PN-UH Series 4K Ultra-HD resolution commercial LCD display line, which launched earlier this year. Booth visitors will get to see six models in the PN-UH Series, including the 43" Class (42 ½" diagonal) PN-UH431, 50" Class (49 ½" diagonal) PN-UH501, 55" Class (54 5/8" diagonal) PN-UH551, 60" Class (60 5/64" diagonal) PN-UH601, 70" Class (69 43/64" diagonal) PN-UH701 and 86" Class (85 5/8" diagonal) PN-UH861 displays. the displays are ideal for hospitality, business and retail settings looking to excel at reaching their audiences. The true-to-life precision of 4K Ultra HD resolution enables customers to see subtler textures and finer details in photos and video. For the first time in North America, Sharp will showcase its new PN-HB and PN-HM series of 4K Ultra-HD professional LCD monitors. Equipped with a built-in system-on-a-chip controller, they allow for digital signage delivery without requiring a dedicated media player. The PN-HB series is designed for everyday 16/7 operation, with a brightness of 350 nits, while the PN-HM series is designed for 24/7 environments and has a brightness of 500 nits. Each of the new series will be available in three class sizes: 65", 75" and 85". The PN-HM851, PN-HB751, PN-HB651 and PN-HM651 monitors will be available at the Sharp DSE booth. Finally, visitors will be able to see Sharp's first-generation 8K Ultra HD 70" Class (69.5" diagonal) LCD monitor, the 8M-B70AU at DSE. The monitor brings 33 million pixels packed into the 7680 x 4320-pixel panel, achieving pixel resolution 16 times greater than full HD. Sharp will also preview an upcoming 80" version which is expected to launch this summer. To get an even larger view of 8K, Sharp will preview a 90" Class diagonal video wall at DSE, consisting of four 45" displays – each one at 4K resolution – which creates a vibrant 8K experience. The Sharp booth will also feature the new Windows collaboration display from Sharp. Designed for room-scale collaboration and intelligent workspace management, this intelligent, cutting-edge display is a game changer for workplace transformation. It combines Sharp's award-winning touch technology with IoT sensors that can work with Microsoft Azure Digital Twins to monitor collaboration spaces and bring the intelligent edge to life. It is also a 4K Ultra-HD 70" Class (69.5" diagonal) interactive display, ensuring stunning visuals and maximum productivity. The system will be set up at the DSE Sharp booth for visitors to experience different types of meeting and collaboration environments. Sharp Imaging and information Company of America, a division of Sharp Electronics Corporation, markets Sharp's business products, including professional and commercial displays. Through U.S. Professional Display Distributor sales channels, Sharp is the top selling volume and revenue share brand of 60"+ Professional Flat Panel Interactive Touch Displays. * Sharp's professional and commercial displays are specially engineered for business applications and are offered in a wide range of sizes and varying capabilities. From high-impact displays for digital signage, to state-of-the-art ultra-narrow bezel video walls, to the award-winning AQUOS BOARD® interactive display systems, Sharp commercial and professional displays help you communicate, collaborate and disseminate information brilliantly. For more information, visit our website at siica.sharpusa.com.